Smiling is both a relaxed and upbeat way to show who you are to the world. Your smile is an expression of emotions like happiness, love and excitement. It is also a window of communication expressing confidence, openness, friendship, vitality and approval. An attractive smile also reflects warmth, contentment, health and self-worth. It can enhance your personal and professional relationships and actually inspires others. A before & after of Dr. Gorman’s patient. So… how do you feel about your smile? Since smiles are unique, how does yours measure up? If you had a magic wand what would yours look like? Is it holding you back at all? What changes would you make to your side? Cosmetic or aesthetic dentistry can help you to achieve whatever it is you see in the mirror of your mind’s eye. There have been tremendous advancements in materials and techniques to provide more natural and life-like solutions. The light reflection, refraction and translucence of current porcelain materials can defy detection when utilized with the art and science of a skilled practitioner and aesthetic ceramist. The application of care, skill and knowledge by the professional you choose is critical to help you enhance your smile. 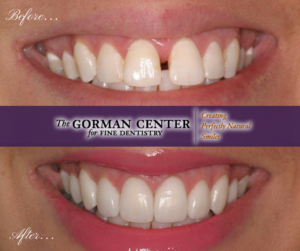 Dr. Gorman believes that every one should love their smile. As an American Academy of Cosmetic Dentistry (AACD) Accredited dentist, Dr. Steve Gorman, has developed a wonderful reputation amongst his patients and his peers and is recognized nationally for his smile design and problem-solving ability. Contact us today to schedule your complimentary consultation so you can start loving your smile. It makes sense that a person’s smile is really important. I like how you said that it allows people to have natural, life-like solutions to their aesthetic problems. My smile is definitely not as good as I’d like it to be, so I’ll have to look into this.